Federal Reserve officials were largely unaware of the financial crisis brewing in 2007, until they found themselves in the middle of it, transcripts released Friday show. The more than 1,300 pages offer the most comprehensive look at the Federal Reserve's deliberations, leading up to the start of the Great Recession in December 2007. It's the central bank's policy to release full transcripts with a five year lag. At the beginning of the year, many Fed officials, including Chairman Ben Bernanke, thought one of the biggest risks was that the economy might grow stronger than expected. At the time, the Fed's key interest rate was at 5.25%, and the central bank was leaning toward raising it further, rather than easing monetary policy. "My recommendation also is to take no action and to maintain a bias toward further tightening," Bernanke said at the first meeting of the year, noting that inflation risk had picked up and the housing market had shown some improvement after slumping in 2006. "The housing market has looked a bit more solid, and the worst outcomes have been made less likely," he said. At that point, they didn't realize that losses from subprime mortgages would ignite the deepest financial crisis since the Great Depression. Fast forward two months, and still, the Fed thought the worst was over for the housing sector. "The central scenario that housing will stabilize sometime during the middle of the year remains intact," Bernanke said at a meeting in March, adding later, "The effects of the decline in subprime lending may have already been mostly seen, since that has slowed from last fall." As it turns out, that spring was merely the calm before the storm. In June, two Bear Stearns hedge funds that had large holdings of subprime mortgages suffered huge losses and were forced to dump their assets. Fed officials discussed the news at their meeting a week later, but they largely agreed that aside from housing, the economy still looked strong. "Significant spillovers have yet to emerge from the housing situation, and other components of demand appear to be strengthening and thereby offsetting the drag from residential construction," Bernanke said. San Francisco Fed President Janet Yellen, however, sounded the loudest warning. "In terms of risks to the outlook for growth, I still feel the presence of a 600-pound gorilla in the room, and that is the housing sector," she said. "The risk for further significant deterioration in the housing market, with house prices falling and mortgage delinquencies rising further, causes me appreciable angst." Fed officials didn't meet again until August 7, and even then, some thought higher inflation was one of the biggest concerns. The theory was that if the housing market weakened, rents would rise and thereby drive up inflation. Meanwhile, New York Fed President William Dudley reported that for the most part, Bear Stearns' problems did not pose a substantial risk to the economy. "We've done quite a bit of work trying to identify some of the funding questions surrounding Bear Stearns, Countrywide, and some of the commercial paper programs," he said. "There is some strain, but so far it looks as though nothing is really imminent in those areas." Again, Yellen said the housing market caused her "appreciable angst." 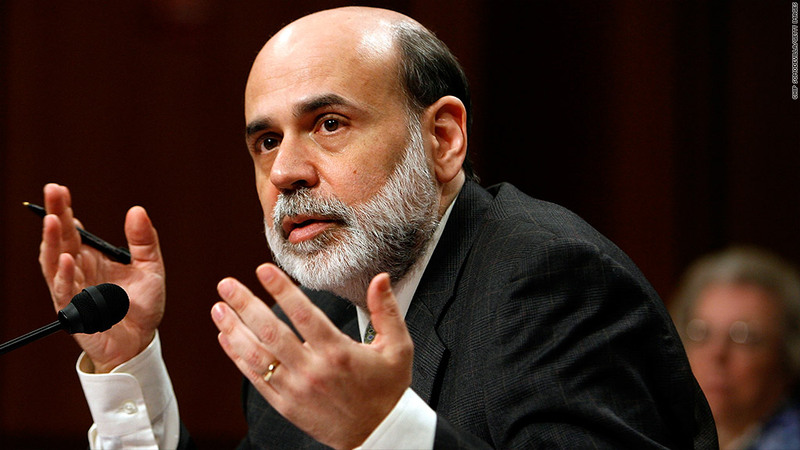 Bernanke largely disregarded that a financial crisis would take place, but also said he believed the central bank could handle it. "We are prepared to use the tools that we have to address a short-term financial crisis, should one occur," he said. "I think the odds are that the market will stabilize," he added later. The Fed left its policy unchanged at that meeting. That was a Tuesday, and over the next few days, stocks plunged as more financial institutions reported problems related to bad loans. On Friday, the Fed held an unscheduled conference call and decided to inject $38 billion into the U.S. banking system. Less than a week later, it held another emergency conference call and decided to cut the discount rate -- the rate it charges qualified lenders, mainly banks, for temporary loans. The central bank meets and starts cutting the federal funds rate, the key interest rate that impacts everything from mortgages to car loans to credit cards. But the Fed still errs on the side of caution, as some officials warn that they could be overestimating the severity of the downturn. "As the central bank we have a responsibility to help markets function normally and to promote economic stability broadly speaking," Bernanke said. "We are not in the business of bailing out individuals or businesses." Fed officials meet two more times and hold another unscheduled conference call. By the end of the year, the federal funds rate is down to 4.25%. "I believe that the most likely outcome is for the economy to slow significantly in the near-term, flirting with recession," she said. Little did they know then, the recession had only just begun.